At SeedLegals, we’ve just launched EMI Options Scheme. We’re getting rid of the expense and complexity of giving out share options, bringing a new easy way for founders to retain, reward and incentivise their team with equity, in just a few clicks. Most startups want to give their employees some kind of stake in the company to reward them for their work because let’s face it, there often isn’t a lot of money to go around by way of salary during the early scale-up days. Share options are a fantastic way to do this. By granting options, employees benefit from a rise in the value of the company and share in what they’re building together. SeedLegals data shows that half of UK startups currently offer options to employees. Despite this, setting up an option scheme is an extremely complex and expensive process. It takes months of messing about with lawyers and accountants to set up, costing between £5k - £10k in fees. At SeedLegals we’ve leveraged technology and automation to change that, for good. It all starts on your SeedLegals dashboard. Just fill a few quick details to get your option scheme started. What was once a serious administrative pain is now simple and easy. And it’s 10 times faster than the old way of doing things too. Once everything is up and running, you’ll be able to manage your option pool as part of your cap table, and allocate options to specific employees with custom vesting schedules, as and when you need to. Employees can log in and check the details of their options whenever they’d like. You can add and remove employees from your scheme in a few clicks – something that used to require more paperwork every time. 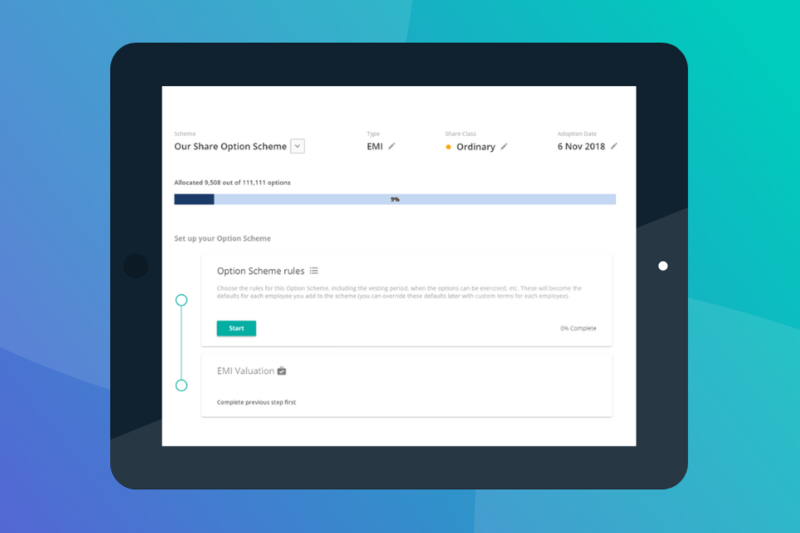 We’ve completely transformed the creation of an EMI Options plan from something that used to be done through accountants on lots of paper, into something you can log in to, track and invite your employees into the platform to get their options certificates and all the paperwork. Setting up an option scheme is finally transformed into a cloud SaaS platform in the same way you would handle your accounting on Xero. Start creating your option scheme now by creating a SeedLegals account or if you'd like a free tour, book an online demo with one of the team.